Briana Foley, registered nurse at CHI Memorial Hospital Chattanooga, received the Daisy Award for Extraordinary Nurses. Ms. Foley works on a medical/surgical floor. She has worked for CHI Memorial since 2017. "CHI Memorial is pleased to partner with the DAISY Foundation to recognize the extraordinary difference nurses make in the lives of patients and co-workers," officials said. "Nurses are chosen each month to receive this wonderful award that honors compassionate care. 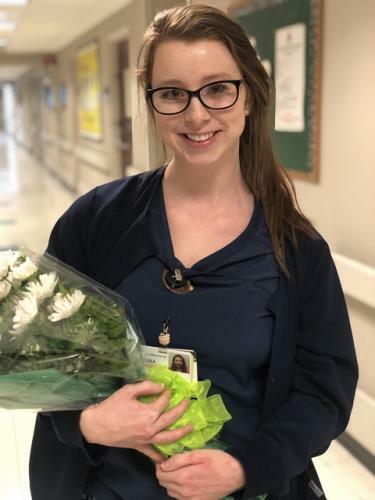 "At a presentation attended by the nurse’s colleagues, physicians, patients, leaders and visitors, the honoree receives a certificate commending which reads, 'In deep appreciation of all you do, who you are, and the incredibly meaningful difference you make in the lives of so many people.' The honoree is also given a beautiful and meaningful sculpture called A Healer’s Touch, hand-carved by artists of the Shona Tribe in Africa, a daisy bouquet and a copy of her/his nomination letter. The honoree's nursing unit receives a cinnamon doughnut party because it takes a team for a nurse to achieve his/her best. Tasty Doughnuts generously donates the treats for this worthy cause."